The oil and gas business is a world of its own. Each of the different phases discussed in this book (exploration, appraisal, development and production) pose myriad challenges for investors. Even large com­panies that have the financial resources and the technical expertise to withstand the uncertainties of the petroleum market often walk away from a project having learned many new lessons. Fortunately for me, I did not venture blindly into the oil and gas world. Yet, I too learned many lessons. who were investing in the Jubilee Field. I had no idea of the depth and turbulence of the trenches I was choosing to venture through. In hindsight, there are several signals missed and many steps that I would manage differently if I were to do it all over again. While all of these lessons learned have been chronicled throughout the pages of this book, I want to take the opportunity to gather some of the more important ones here in a compendium for students, investors and others interested in learning a few things about this maddening, exciting, often-tumultuous business from a man who has been there and managed to succeed in it. The first and foremost lesson learned in my experience in Ghana was the same one that I can trace all the way back to my father and my grandfa­ther: be honest and sincere in everything you do. Approach your life and business endeavors as if somebody might someday come behind you to investigate all your actions. Don’t cut corners, pay your taxes, and obey all rules and regulations. Those were among the basic tenets which saved EO Group from prosecution and forfeiture. This lesson, of course, harkens back to the Golden Rule in the Bible: treat others as you would like to be treated. Another big lesson learned had its genesis in the first day that the agreement was signed with the Ghana Government and GNPC: local expectations. I had felt a nervous energy about the idea of managing local expec­tations, thinking that was the duty of the government and GNPC to handle. Although I had always been confident in Ghana’s ability to use the oil discovery opportunity to uplift the country, rather than to send it down into chaos, the citizenry embraced the assumption that with oil discovery would come an overnight transformation of the nation into an economic paradise. There was always an unfortunate misconception in developing coun­tries that with the oil money, any country would build hospitals and schools, every village and town would get electricity and luxury ameni­ties, and every road and highway would be paved overnight. Everyone was waiting in line to be rich. The enthusiasm of the locals even led to people abandoning their vocations in search of their share of the newly found wealth that was supposed to flow from the oil discovery. Once the reality began to set in, however, this disillusionment gradually lent itself to heightened tensions and distrust toward the leaders. The News Media: Stay Quiet, or Fight Back? One of the most difficult lessons to have learned through this ordeal was the influence and impact of an incredibly polarized media environment. In Ghana, political parties are often affiliated with the media com­panies, and in some cases own them outright. These media companies in turn become political mouthpieces and vehicles to promote one side of a story against another. When an entrepreneur is caught in the middle of these competing agendas, he becomes a casualty of a system that can be brutal, biased and unforgiving. Libel and slander take on an entirely different meaning in this climate, and actions that would easily be considered unethical or even illegal in some parts of the world, easily become the order of the day in others. For three long years, I had to endure some of the most painful and malicious allegations against me. I saw firsthand how radio and televi­sion stations blatantly ignored the facts of the case and sold a particular agenda to shape public opinion. For example, there were reports in parts of the capital city, Accra, which insinuated that there was no oil discovery at all, and that it had been an elaborate hoax. Other media reports, in an effort to manipulate the public’s perception for purely po­litical reasons, even portrayed the oil I had poured out on that plate for President Kufuor and the world to see as everything from engine oil to cooking oil, and not the premium grade petroleum that it actually was. The challenge for me, without any avenue to counter-report in­stances of false media information, was to keep a focus on why I had embarked on this journey in the first place: it was for Ghana, not for this political party or that multinational corporation. The lesson learned here was simple: when the media hits you with lies, punch back immediately with the truth. Because EO Group took so long to respond to the lies and the misleading half-truths being ped­dled against the company on a daily basis, it became very difficult to undo the damage when we decided to fight back. So respond right away to any negative or false newspaper reports about you or your business, because lies repeated without response or repudiation from you could be regarded by the public as truth. If you wait too long or if you think you are “taking the high road” by not engaging with negative reports from people with nefarious agendas, it only feeds a public impression that the reports must be true if you’re not refuting them. We should have managed the political situation in the country better by engaging all stakeholders in a transparent manner. In the absence of this effort, this brought up the challenge of operating free of a polit­ical agenda: I had no political clout, and EO Group did not have the resources of a government entity dedicated to ensuring its survival. I had been particularly, deliberately conscious of not turning my business aspirations into political machinery. Still, we could have done more to engage all sides of the political climate early in the process. Here again, it comes down to managing expectations. Perhaps we could have avoided many of the rumors if the companies involved held occasional symposia and informational conferences to include the Ghanaian public in the lessons we were learning along the way. That may have created an air of transparency and made the stakeholders available to deflate any myths that were being sold to the public through political parties and the various media outlets. Another lesson learned had to do with laws in the country of operation as well as laws affecting individuals who operate in foreign nations. For example, anti-bribery laws such as America’s Foreign Corrupt Practices Act (FCPA) shouldn’t be taken lightly—even if you’re a US citizen working in a foreign country and you follow local customs of giving “gifts” to officials. The FCPA makes it unlawful for individuals and business entities to make such payments to foreign government officials to assist in obtaining, conducting, or retaining business. Despite the difficulty and potential conflict in perceptions, it is im­portant for employees to understand how the law applies to them and the consequences of any violation. We could have lost everything if we had not complied with these laws. Many international companies have been fined millions of dollars and people have gone to jail for violation of Anti-bribery laws. Some of my experiences in the oil industry in Ghana may have been unique to the region or the country, but several of the underlying busi­ness, personal, and contractual lessons are no different in other parts of the world. For an investor, there is always work to be done, a clock ticking down, with every second having a financial implication. The invaluable lessons had been about people, about relationships, about business, and certainly about life. 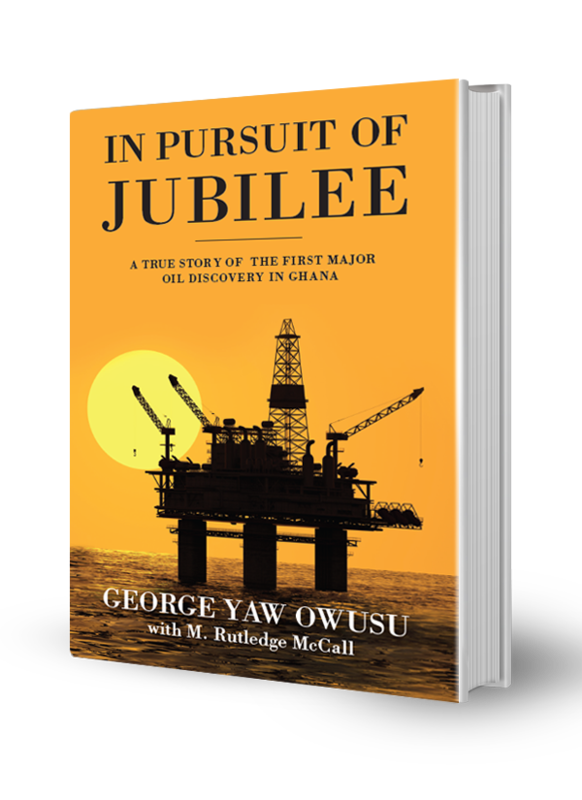 Standing on the other side of the painful ordeal, maybe all that I had gone through for my new life as a businessman and investor will be forever etched in Ghana’s history as the Jubilee Field discovery. Through it all, the Jubilee Field had become a successful enterprise for Ghana, as well as for the stakeholders, who made significant financial commitments to make this dream a reality. The lessons learned along the way had been many, and the emotional tides had swung from one end to another, but there is nothing that transcends the gratification of seeing a country realize its potential: creating economic opportunity as it was imagined. For the many investors and entrepreneurs who will read my story and take their own cautionary steps to ensure they did not fall into some of the same pitfalls I encountered, my journey will have been worthwhile. For Ghana, a country that still has so much promise and enormous po­tential to become the beacon of economic hope it aspires to be, every pain and sacrifice I had lived through will have been worth it.